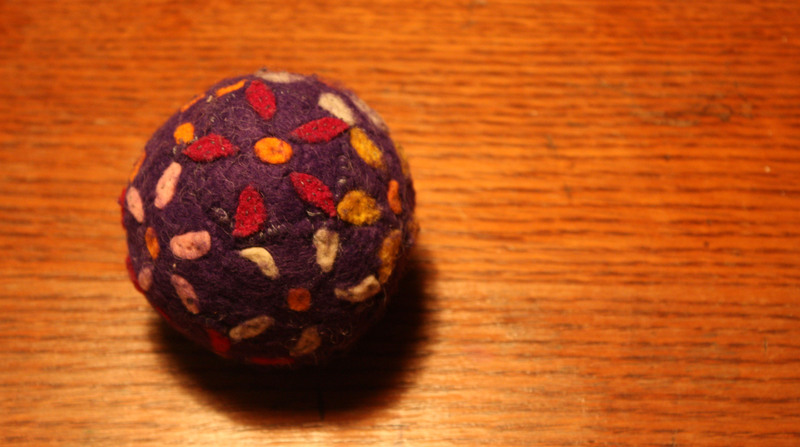 I am excited about this Rearview Fridays post — it’s a very old project, I made this felt pentagon ball when I was about 10! Earlier this year I wrote about some toys, balls and animals, that I’d made when I was in grade 4. And this is the ball I couldn’t find to include in that post, it’s the 5th toy I made that year. This one is really precious to me, I was so proud of it. First I stitched the five-petaled flowers on each of the 12 pentagons and then sewed all 12 pieces together, by hand of course (it was Waldorf school after all)! 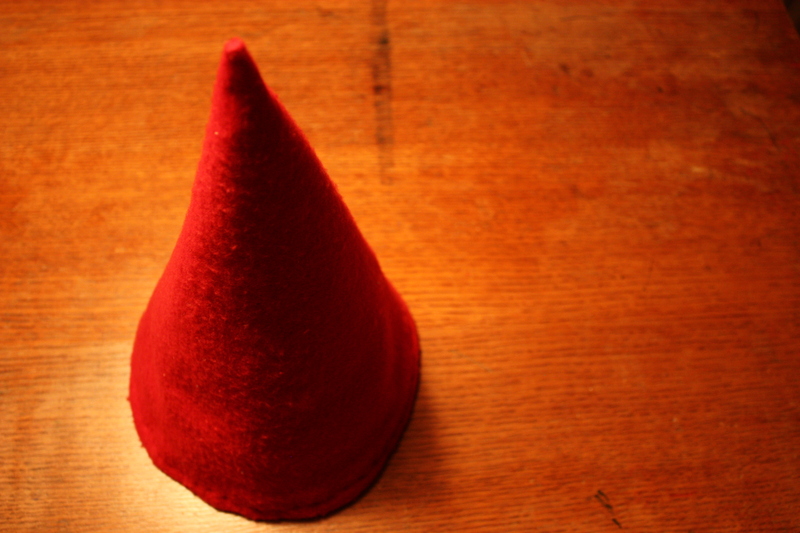 It’s stuffed with fleece and has a bell in the middle. I’m sure there was a math lesson attached to this creation in addition to the sewing aspect! I do remember thinking I wanted to keep it for when I had kids (I was a planner!) and I managed that — both the having kids part and the keeping the ball bit! Gene and I tossed it around yesterday and he loves the bell. I’m blowing kisses into the past towards my younger self, planning, stitching, filling a cold day with a delightful project, just as she would be 25 years later. I love Candy Corn. Not really to eat, I actually find it cloying and a bit meh, but I LOVE how it looks! I was inspired by a September post on The Purl Bee for these charming knitted candy corns. This halloween is going to pass me by before I manage to knit one, but come 2013, look out! Anyways, it got me thinking how candy corn is a great decoration. And I also love me a good bunting (aka garland or pennant strand). And I thought: candy corn bunting! I googled to see what was out there — and there are lots, but none that I really loved. So I made my own. And I decided to share it with you! You can click HERE for the free pattern. I am no photoshop wizard, I aspire, but I cobbled this together and hope it inspires all sorts of candy corn bunting glory! 1. 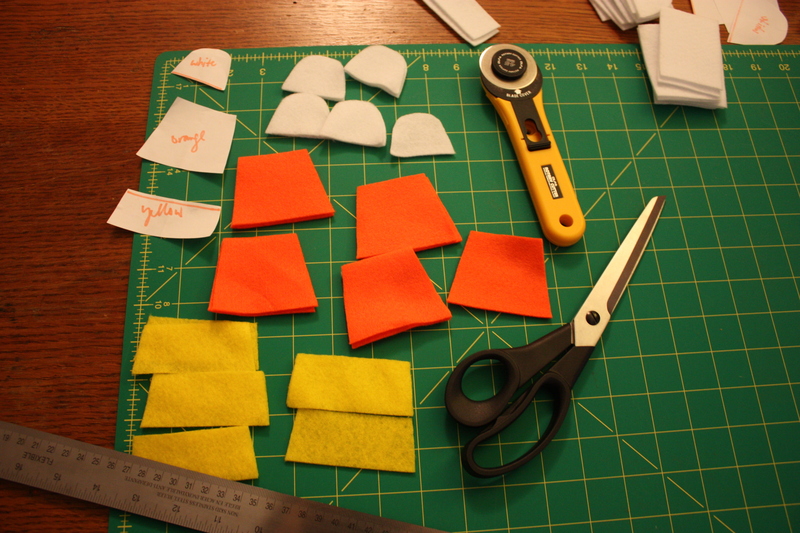 I grabbed some craft felt ends I had lying around and cut my candy corn pieces. In this case I’d decided I’d go with seven pieces on the strand, so I needed seven pieces of each colour. 2. a. 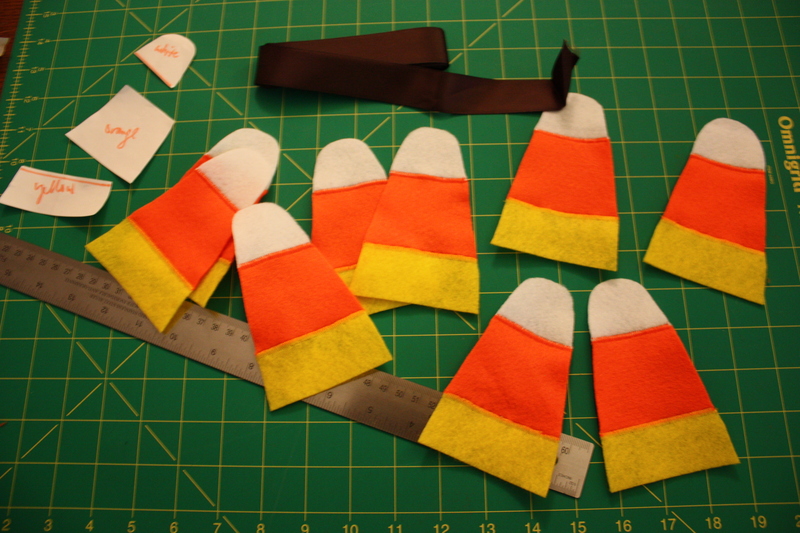 Using a wide, tight zig-zag stitch, I attached the candy corn pieces together. 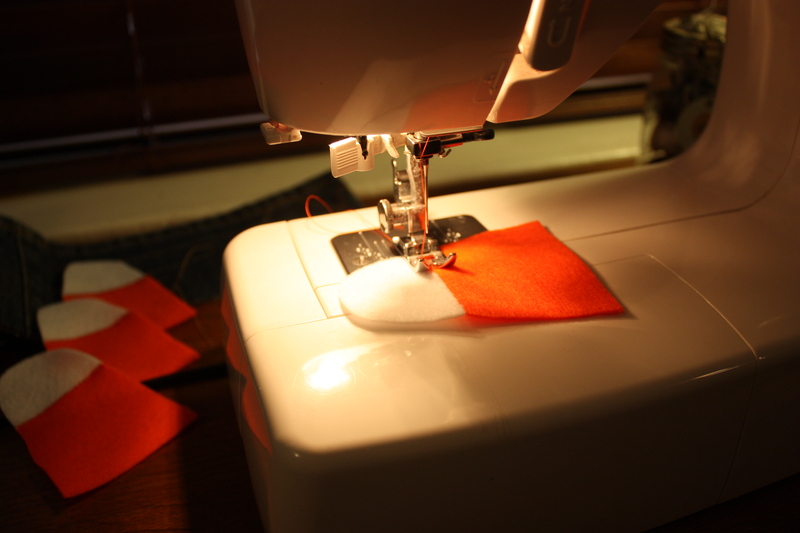 I kept the pieces flush and the seam line right in the middle so that the zig-zag grabbed both sides of the felt. 2. b. I used orange thread between the white and orange pieces and yellow thread between the orange and yellow pieces. 3. Next I measured out a piece of 1″ wide brown ribbon (bias tape works well too) to length. 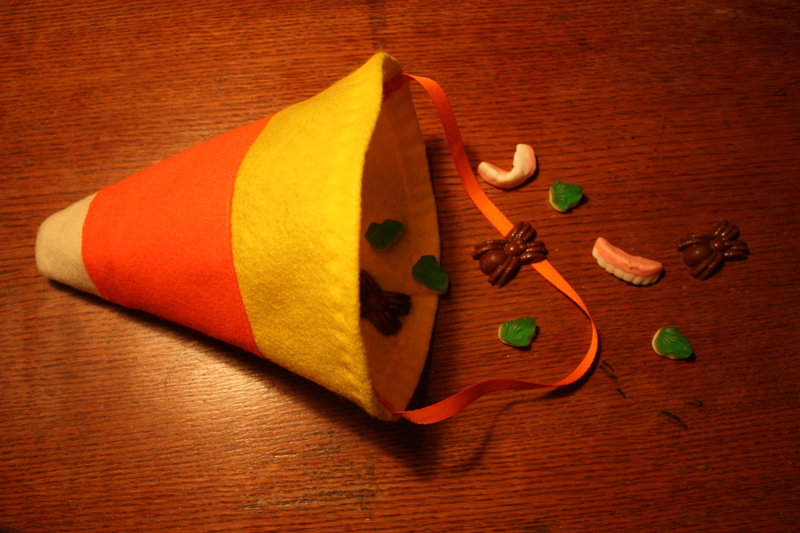 Because the felt candy corns are 3″ wide at their widest point and I wanted 2″ in-between each corn, I calculated 5″ for each corn, plus an extra 15″ on each end to allow for securing the finished bunting. 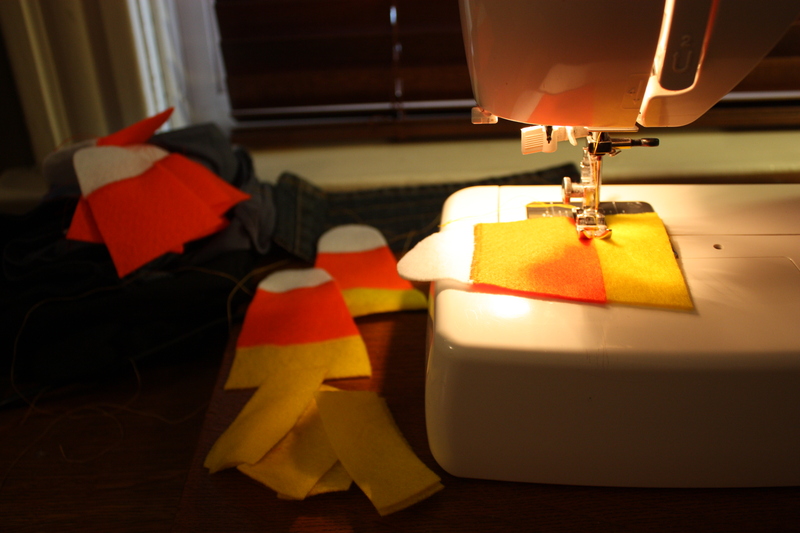 So with my seven-piece candy corn bunting, I cut a length of approximately 65″. 4. 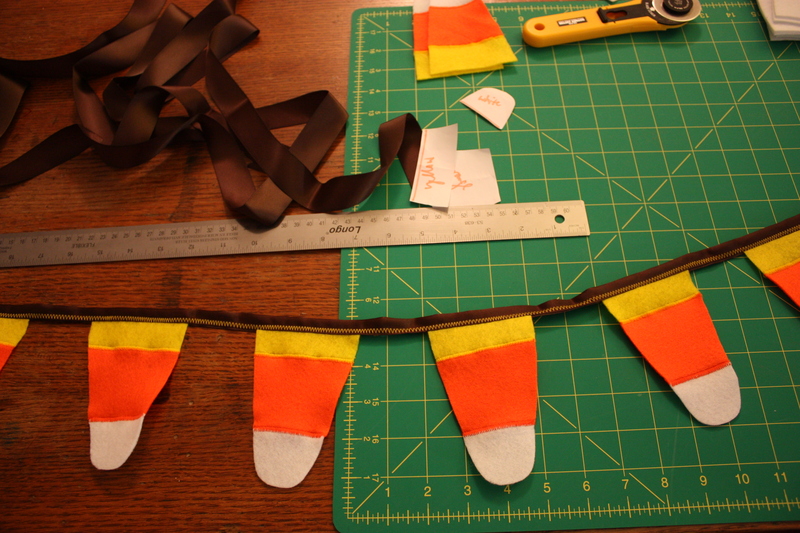 Next, I pinned my finished candy corns onto the ribbon, about 2” apart. In this case I pinned them halfway up the 1″ ribbon and folded the ribbon over the felt so the finished ribbon is 1/2″ wide. 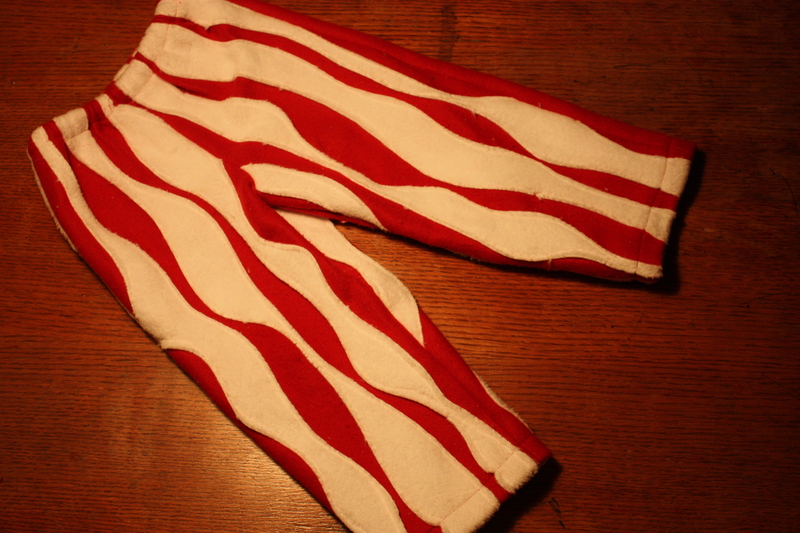 Then I sewed ’em down with a zig-zag stitch. 5. Lastly, I made some loops on the end of the ribbons so that the bunting can hang from hooks or tacks. I also left the ends long enough that they can tie. I used yellow thread on the brown ribbon. Kind of Charlie Brown-ish, love it. 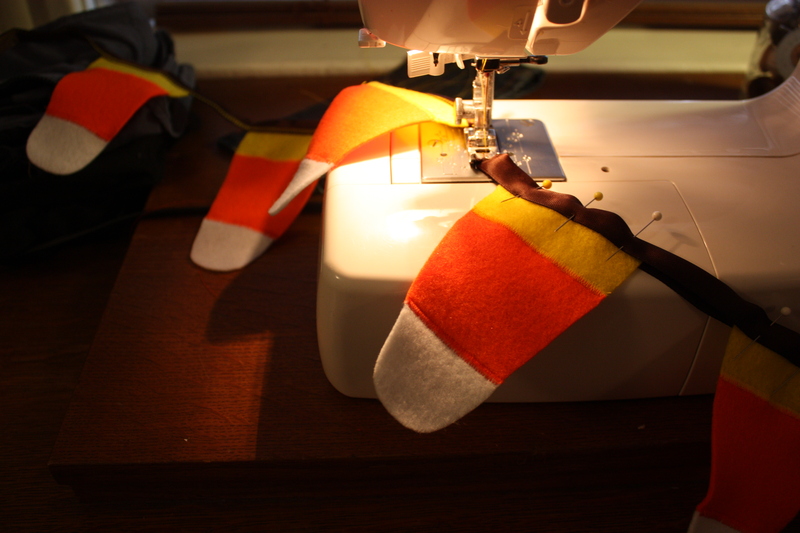 Download the CANDY CORN BUNTING PATTERN right here for free! If you make one, send me a picture, I’d love to see how it evolves. This little candy corn bunting was bound for a dinner party at a dear friend’s house. 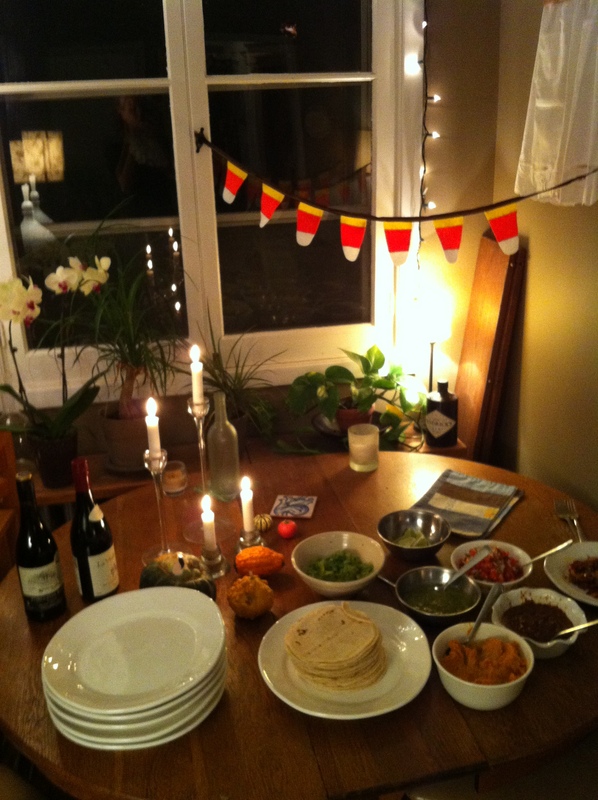 Here it is in it’s little glory, sitting above a delectable fall feast! Happy candy corn season folks. CANDY CORN BUNTING PATTERN – a free download! Another Friday, another long-ago project to share. 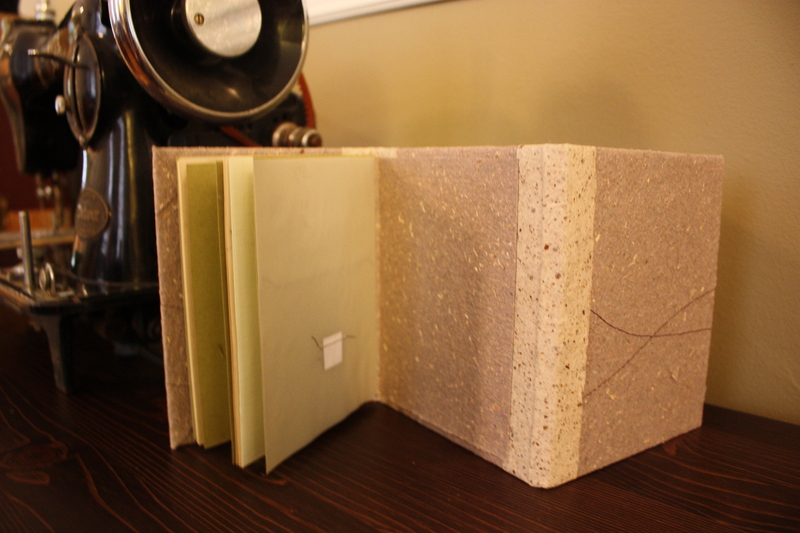 About 11 years ago my friend Lindsay Zier-Vogel taught me how to make hardcover books. I’ve made a lot since. 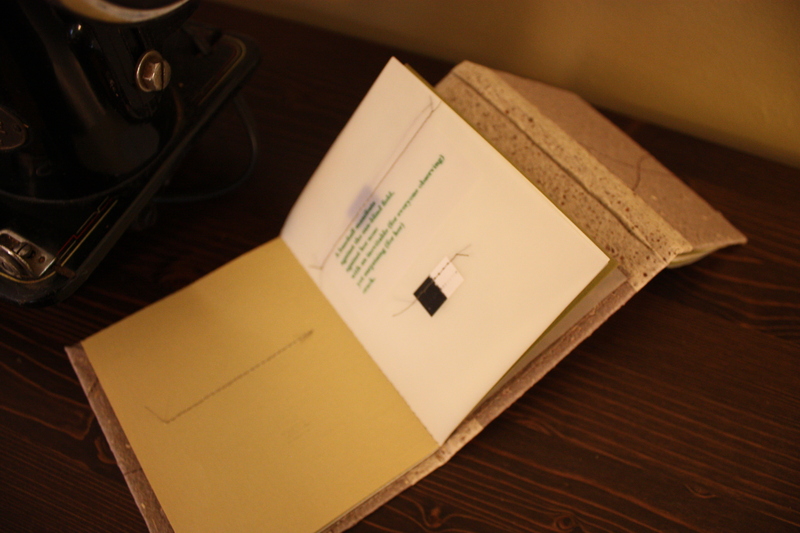 It’s surprisingly easy (to make small, carfty, arty books that is, I am definitely not a professional book binder!) 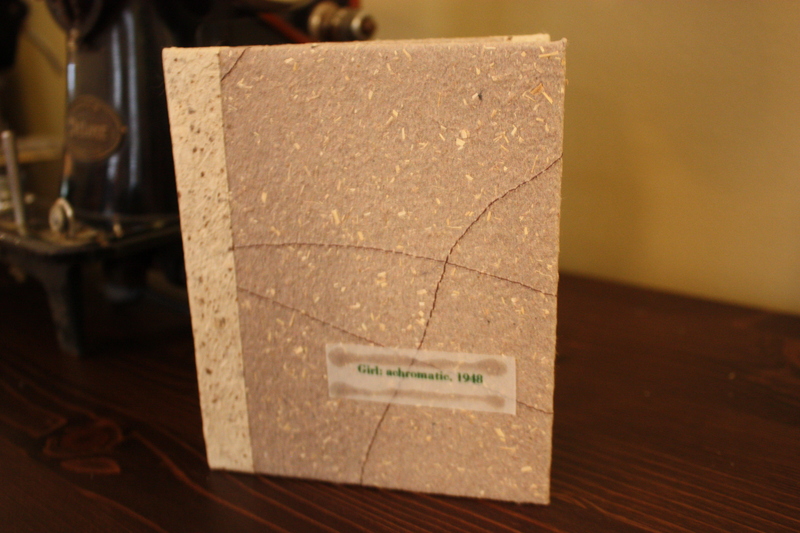 and I’ve made diaries, recipe books, poetry books with kids, art books. 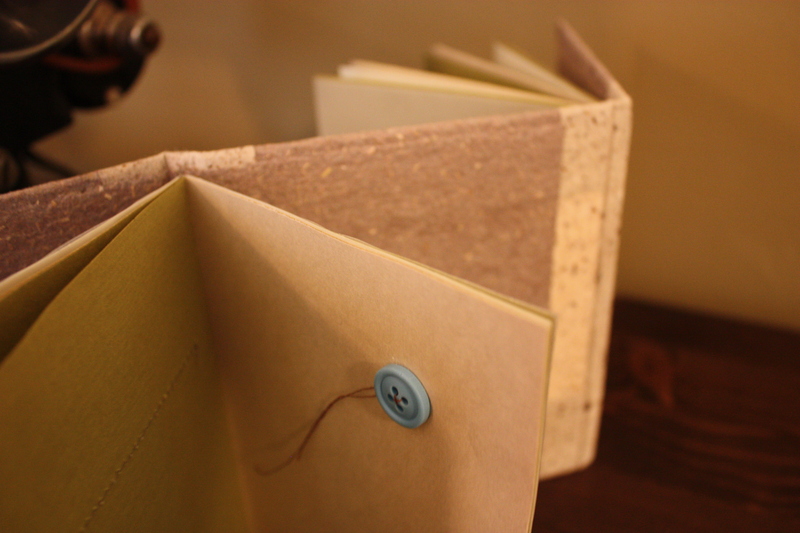 Lindsay continues to makes gorgeous art/poetry books, you should check them out here. 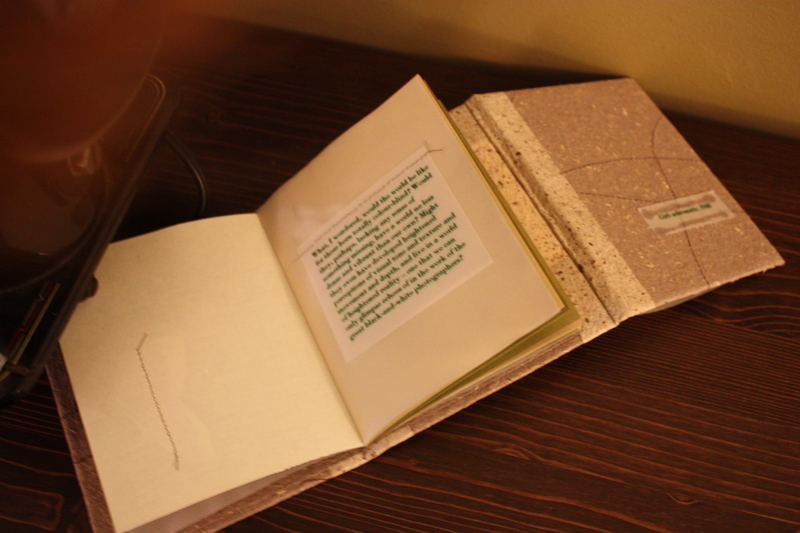 One of my most ambitious was a book I made in 2005, it’s two books in one with a double spine. 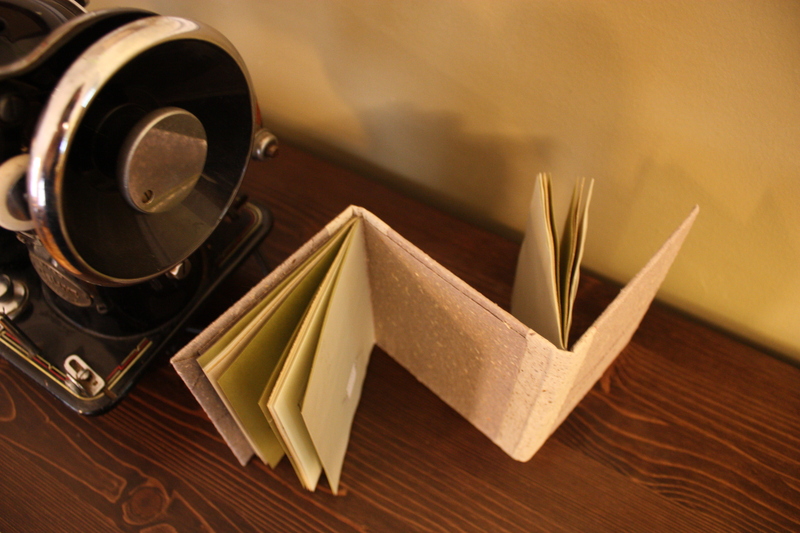 A zig-zag book! I was researching Achromatopsia, a condition of the eyes that my mom has where her eyes see in a spectrum of grey, black and white, no colour. I was curious about how her eyes work because it’s hard for me to imagine not seeing colour, and I was working towards a conceptual dance work about seeing in black and white literally and figuratively. I had read Dr. Oliver Sacks’ book The Island of the Colourblind. I has also written some poems about the content I’d gathered. I’m not particularly a poet, not publically, but writing poems can be a great tool when distilling technical info and autobiographical narrative towards a work of art, in this case the choreography, costumes and soundscore I was working on. I had a bunch of favourite quotes and my modest poems and thought they should have a home, so I made them a book, quotes on one side, poems on the other. What, I wondered, would the world be like for those born totally colour-blind? Would they, perhaps, lacking any sense of something missing, have a world no less dense and vibrant than our own? Might they even have developed heightened perceptions of visual tone and texture and movement and depth, and live in a world of heightened reality – one that we can only glimpse echoes of in the work of the great black-and-white photographers? He is intrigued by the range of words and images other people use about colour and was arrested by my use of the word ‘azure’. (‘Is it similar to cerulean?’) He wondered whether ‘indigo’ was, for me, a separate, seventh colour of the spectrum, neither blue nor violet but itself, in between. and dusk reveals the neighbourhood. Crayons were responsible for her early reading skills and the betrayal of her eyes. She learned to recognize their names through necessity: red, brown, blue, tangerine, aubergine – whatever that might be. She generally steered clear of the exotic ones, to avoid being the lone pre-schooler who drew purple palaces sporting taupe moats and devastatingly beautiful green princesses. She had been informed of the concrete facts by Miss Jamison 3 months into the school year: only dragons are green, dear and a moat is filled with blue water just like the river, see?